​A community engagement program with the San Diego Police Department. ​Game Changer is a program created by our friends over at Embrace, a non-profit organization who has helped our local veterans for years. 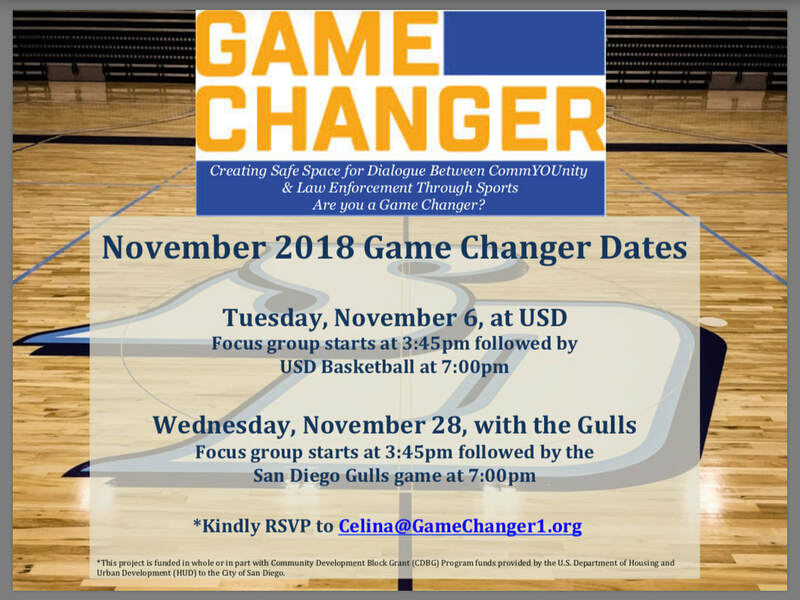 Game Changer was created to create a positive, safe space for both community members and law enforcement to discuss issues the community may have of our law enforcement and to create solutions to better grow the relationship between law enforcement and the community. ​THIS IS NOT A TOWN HALL OR A CENSUS SESSION. This program allows everyone to speak, ask questions, and discuss positive solutions. After the discussion portion is done, we all head to a free sporting/entertainment event to hang out and grow together rather than just head home. They also provide free food and transportation via a Uber promotion code good for a round trip to a Game Changer Event. ​We are pleased to support this positive program stimulating our mission to community engagement as a portion of the transition process for our veterans. As veterans we know what the hardships are of wearing the uniform and being put in incredibly difficult and intense life or death situations. We have a lot to bring to the table, and we have the ability to help bring support and understanding to our law enforcement in our community. If you want to help lead the charge in your community with this program, please go to www.imagamechanger.org and learn more.